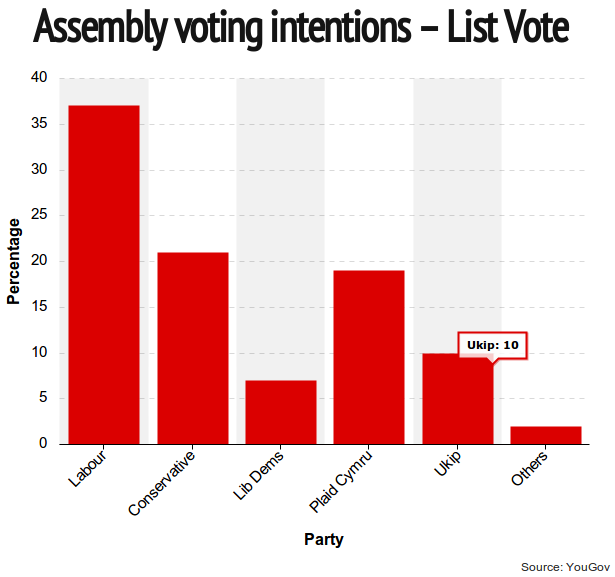 A YouGov poll has predicted five Welsh Assembly seats for UKIP in 2016 at the expense of the Lib Dems, Labour and the Tories. The poll, which also predicts the loss of Plaid Cymru's only MEP, predicts Labour and the Tories losing one seat each to UKIP on the regional list and the Lib Dems losing three to become the fifth party in the Senedd after UKIP. A lot can happen between now and the 2016 elections but this is encouraging. All that is needed to capitalise on this early poll result is a coherent policy on the Welsh government that the public can vote for and we could see UKIP representation at all levels of government by 2016 (except the Scottish Parliament of course).